Paul Strassmann’s blog: What is the Efficiency of DoD IT Spending? What is the Efficiency of DoD IT Spending? Any aggregation of computers, software and networks can be viewed as a “cloud”. DoD is actually a cloud consisting of thousands of networks, ten thousands of servers and millions of access points. 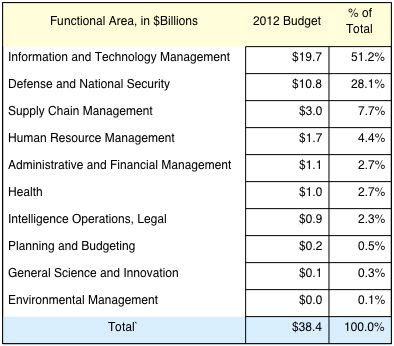 DoD FY12 spending for information technologies is $38.4 billion. In addition IT includes the costs of civilian and military payroll as well as most IT spending on intelligence. The total DoD cloud could be over $50 billion, which is ten times larger than the budget of the ten largest commercial firms. The question is: how efficient is DoD in making good use of its IT? Efficiency of any system is defined as the ratio of Outputs to Inputs, also known as the productivity ratio of any enterprise. If only a small fraction of Inputs is converted to Outputs then IT can be labeled as inefficient. The metric of the productivity ratio is always evaluated in dollars. Such numbers are readily available for DoD because the Office of Management and Budget (OMB) publish analyses of IT costs every year. OMB lists the “information and technology management” function for IT. This includes all planning, administrative, management and acquisition costs as well as communications costs that cannot be attributed to any specific output. This tabulation shows that only 48.8% of DoD functions are related to the costs of output. The remaining 51.2% is attributed to “management”, which includes expenditures for CIOs of OSD and components staffs. The IT Ouput/Input ratio for DoD can be estimated to be less than a half. Is the 48.8% ratio a good measure of IT performance? Can it be compared with the best commercial practices? I have worked with productivity numbers for more than thirty years. Have published over hundred articles and books on this topic and own a Registered Trade Mark on Information Productivity. In terms of IT spending per capita DoD is most comparable to the financial services sector because of its large amount of purchase transactions and huge assets. On the basis of comparison with major banks, whose IT budget for the top firms averages $2 billion, the IT productivity has always shown a ratio between 70% and 80% in contrast with less than 50% for DoD. The primary reason for the difference between commercial firms and DoD are the expenditures for IT infrastructure maintenance ($7.7 billion) and for IT information security ($2.8 billion). These two items account for more than half of the communications expense that is included in the management costs of DoD. With an estimated number of 15,000 networks the first priority for any future cost reductions should be the consolidation of communications. According to a 2006 GAO report the Global Information Grid (GIG) was supposed to achieve major reductions in the number of networks. That has not happened. DoD must restructure its IT communication operations from an environment where it is vulnerable to multiple cyber attacks. Cutting down on the number of networks requires shifting of computing to a much smaller number of enterprise clouds. That will reduce costs as well as increase security.